Property 2: The Cottage - New Studio cottage with Central Air! Property 4: Ginger Plum Cottage - Classic cottage 400 feet from the beach! Property 6: A classic and sweet Cape Cod getaway! GREAT LOCATION 103 GREY NECK RD. LAST TWO WEEKS OF AUGUST STILL AVAILABLE. Property 9: GREAT LOCATION 103 GREY NECK RD. LAST TWO WEEKS OF AUGUST STILL AVAILABLE. Property 11: Small Scales - Vacation Central in Harwich Port! Steps to beach and downtown! Property 12: Small Scales - Vacation Central in Harwich Port! Steps to beach and downtown! NEW! Cozy West Harwich Cottage - Walk to Beach! Property 15: NEW! Cozy West Harwich Cottage - Walk to Beach! Cozy cottage w/ a furnished patio & backyard playset - walk to the harbor! Property 16: Cozy cottage w/ a furnished patio & backyard playset - walk to the harbor! Charming cottage. Quiet location. Short walk to beach. Property 17: Charming cottage. Quiet location. Short walk to beach. 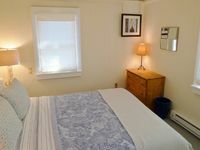 Archibald Circle - Walk to the Beach, Clean Cheerfully Furnished. Property 18: Archibald Circle - Walk to the Beach, Clean Cheerfully Furnished. Harwich Vacation Home central to all the Cape has to offer! Property 19: Harwich Vacation Home central to all the Cape has to offer! Truly a Cape Cod Original. Property 21: Truly a Cape Cod Original. Ocean View! Location, location, Steps from the beach!! Property 28: Ocean View! Location, location, Steps from the beach!! Heaven's Hideaway - Dog friendly & waterfront! Property 31: Heaven's Hideaway - Dog friendly & waterfront! Property 32: Harwich Port - Beautiful Beach Neighborhood. Property 35: STEPS FROM THE OCEAN!! Property 36: Hurricane Pines - Across the street from the beach! Property 43: Beachcamp Cottage + Only 50 Steps to the Beach + Updated & Close to Everything! Property 48: THE BOAT HOUSE LOFT of Cape Cod ~ Amazing Waterfront Vacation! Property 49: ELEGANT SIMPLICITY ON CHATHAM’S WHITE POND! Rating Details: The property manager was very helpful. The vacation rental was spotless. I was very happy with the location. I was very satisfied with the condition of the vacation rental. Overall, I recommend this vacation rental. Reviewer Comments: Cozy and pleasant. All that we needed was there. It was a super hot week so the air conditioners in the 2 bedrooms and the fans in the kitchen and on the porch were wonderful.Close to our favorite fish &amp; chips: Chatham Fish Market. Nice eating outside on picnic table. We moved the table on the porch so we could see the woodsy view while we had our brunches.